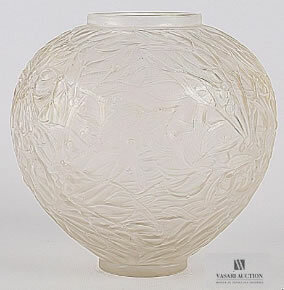 Rene Lalique Vase Gui: A re-offer of the vase only from December 15, 2018. Now Lot 38 Est: €300 - €600. 17 cm tall shouldered and tapering to a small round base mistletoe decorated frosted glass R. Lalique Vase. Lot No. 87 Est: €300 - €600.